The United States and the Fish and Wildlife Service just announced it was going to stall another year before coming up with a plan to save the jaguar. The plan to help them come back by protecting some critical habitat is stirring up trouble among the usual suspects (cattlemen) and someone you wouldn’t suspect (a jaguar biologist). The jaguar (Panthera onca) has been on the endangered species list since 1972, but only as a foreign species. So that’s meant the FWS hasn’t had to even think about it. The FWS itself says the spotted cat used to live in California, Texas, Arizona, New Mexico and maybe Lousiana. But it took the Center for Biological Diversity continually suing them for 13 years to get them to come up with a plan to bring them back. The FWS lost the court battle in 2009. In January 2010 it came back and said, yes, we think it would be “prudent” to set up a critical habitat. But, we need a year to figure out where it will be. And now they’ve said, um, we need one more year. Really, the 39th year. Where will this habitat be? 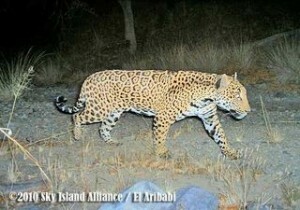 There have been four jaguars confirmed in the U.S. in the last 14 years. Last year one was done in, accidentally, by the Arizona Fish and Game Department. 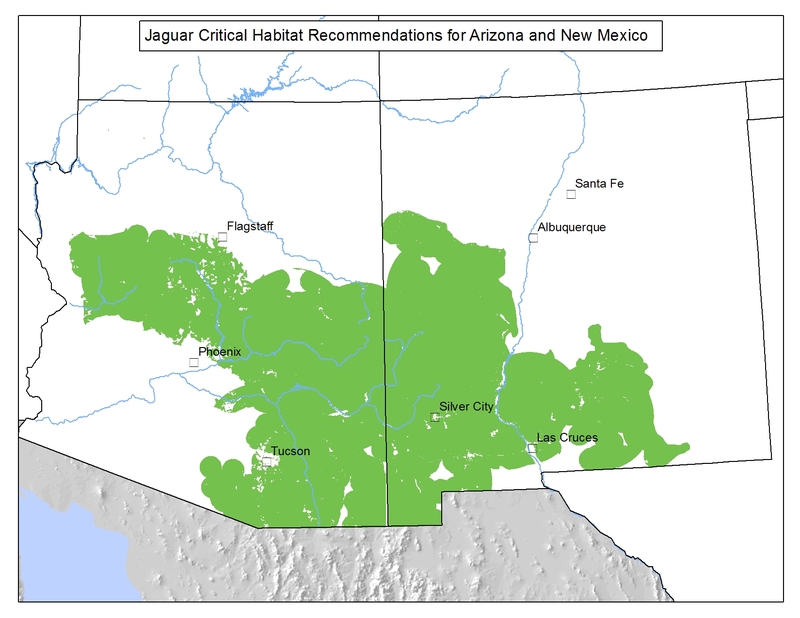 The Center for Biological Diversity wants a huge swath of plains of lower Arizona and New Mexico. If the FWS gives the jaguar anything, it’ll probably be small because they have defined the critical habitat as where the animal lived “at the time of listing.” Any animals hunted, poached, hit by cars, poisoned by ranchers before then are just out of luck. About 18,000 jaguars were killed for their coats in the 1960s and 1970s, Panthera says. Zoologist Alan Rabinowitz wrote in a New York Times op-ed last January that the U.S. shouldn’t bother with trying to save the jaguar in the United States, but concentrate on where they’ve been pushed back to–Latin America. That’s where he started the world’s first jaguar sanctuary (Belize). He’s also CEO of Panthera, which is trying to save big cats around the world. Rabinowitz argues that the jungle habitat is better for the cats. If jaguars exist in Latin America, you can’t call any habitat here critical to their survival, he argues. But if that were true, no habitat is ever really critical because there’s always someplace else the animal could survive. That’s pretty much the way the FWS deals with any sticky wildlife conflicts. They designate species that are on the cusp of extinction–whooping cranes and Mexican gray wolves–as “non-critical, experimental” populations. Then, if someone kills one of the animals, the FWS rarely bothers to charge the people with actually killing an endangered species. But oddly for the jaguar, even that would be step up.